Uses 80% less energy than conventional hand dryers. 95% cost savings versus paper towels and eliminates their maintenance while improving restroom hygiene. 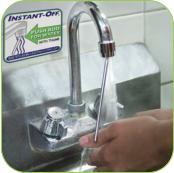 Conserves water, reduced water costs, and eliminates cross-contamination caused by touching faucet handles. Installs on any size threaded pipe. Free Energy Evaluation for any restaurant that completes the survey with Incentives up to 70% for Equipment Upgrades. Discover where your restaurant is wasting energy and the programs available to assist you. $100 Gift Certificate towards a future purchase. FoodBizSupply.com is the largest online retailer of environmentally appropriate alternative products and eco friendly packaging for food service. We provide buyers the convenience of a one-stop-shop for 300+ biodegradable and compostable products and packaging for food service – and growing. Our products are made from natural and renewable resources instead of petroleum and range from Bio-starch plastics, Bamboo tableware, PLA, and even Sugar Cane fiber. As we do not believe there is one “green” solution for everyone, we are constant search to find the right solutions to meet a variety of demands, from independent food service operations to large catered events. In essence, we make going green a lot easier. World Centric donated a sampler of Fair Trade and Compostable packaging for restaurants. World Centric is a retailer of Fair Trade and compostable products both online and in stores. The World Centric mission is to provide sustainable products for a better world. Their packaging is created to meet restaurant specifications for safety and branding while using materials and processes that have the lowest environmental impact possible. That includes using FSC paper, recycled content, and rapidly renewable materials. Their goal is to reduce pollution and waste, save energy and water, and improve biodiversity and habitats. World Centric strives not only to sell high quality certified compostable products but also to be a model of sustainability in their own business operations.